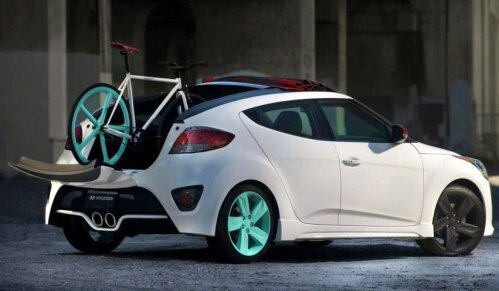 The Hyundai Veloster C3 Roll Top Concept is based on the Veloster Turbo in terms of the drivetrain and basic exterior design but the majority of the rest of this unusual concept is 100%. As you can see in the image on the right, the Veloster C3 Roll Top Concept features a canvas retractable top that moves on a set of tracks mounted in what remains of the roofline. Convertibles with a top that moves like this - while still leaving much of the roofline in place – is not all that unusual with current production convertibles like the Fiat 500c utilizing a similar design. However, where the Veloster C3 Roll Top Concept differs greatly from a tradition cabrio is that the canvas top can also be collapsed all of the way forward to allow much larger cargo to fit in the back. Bolstering the ability to haul more cargo in the rear, the Veloster C3 Roll Top features a modified “trunk” area that is lined with recycled skateboards and the rear panel of the back seat is also lined with the colorful wooden planks. This way, when the rear seat is folded down, the entire cargo area is lined with wood for easier loading. Finally, the Hyundai team removed the standard rear hatchback door in place of a tailgate style door that opens downward and includes a built-in bike mount. "We visit several shows and events like the International Contemporary Furniture Fair (ICFF) in New York City every year to find new, exciting and interesting materials," said Liz Curran, Hyundai color and trim expert from Hyundai Design North America. "This year we uncovered Art of Board, a company that makes hand cut tiles from 100 percent recycled skate decks. The decks are very durable and repurposed into art, shelves, benches and chairs. Every scratch, scrape and gouge is kept intact – adding character and making them truly original and each with its own story. They're alive with texture, shape and color." Like the standard 2013 Hyundai Veloster Turbo, the Veloster C3 Roll Top Concept is powered by the 1.6L turbocharged GDI 4-cylinder engine that boasts 201 horsepower and 195lb-ft of torque but unlike the current production Veloster Turbo – this unique concept has been fitted with a free flowing exhaust system that gives this hot hatch a little more bark. This design really makes for an ingenious LA Auto Show concept car as it is not unusual to see a car that is sold as a hardtop transformed into a convertible concept, Hyundai has taken that direction to a completely new level with this dual purpose roof design. Owners will more than likely spend more time with the top rolled all of the way back to enjoy the open air freedom of convertible cruising but there is no question that the ability to roll the canvas top forward for increased rear cargo space makes this the most capable compact hatchback we have seen. The Hyundai Veloster features a truly unique 3-door design with two doors on the passenger side and one larger door on the driver’s side which makes moving cargo or kids in and out of the rear seats much more comfortable…adding a new, unique convertible top design that further increases the usefulness of the Veloster design is a great move. Unfortunately, this design may seem a bit too crazy for a production model but perhaps the Hyundai Veloster C3 Roll Top Concept is the Korean automaker’s way of hinting that some sort of convertible model for the Veloster is on its way? Only time will tell but in the meantime – the C3 Roll Top Concept shows what that company is capable of doing with their funky, fun little hatch. Oh Snap... THIS IS IT. How stupid are american manufacturers for not getting there first with this. You know Hyundai stole this from the Mila Coupic concept. If they get to market first with this.. and you know they will it will be a damn shame and will leave me with no option but to buy this brilliant car.